The Duchess Lorikeet (Charmosyna margarethae) is also known as Lori De Margaret, Lori De Marguerite, or Lori De Margarita. 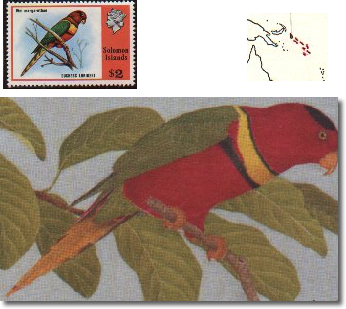 This lory is endemic to Papua New Guinea and Solomon Islands. Its natural habitats include subtropical or tropical moist lowland forests, subtropical or tropical moist montanes, and plantations. This parrot is threatened by habitat destruction. This colorful lory averages 20 cm / 8 inches in length, from beak to the tip of its tail, and weighs around 40-60g or between 1.4 to 2.1 oz. Males: The plumage of males if bright red; with a purple/black hindcrown to occiput. The rump and the upper tail coverts are olive/green. There is a wide yellow band across chest. The thin yellow collar on the mantle is bordered above by a purple/black line. They have a dull mauve/black lower breast; a dull yellow underwing band and the red tail feathers are tipped with yellow. They have an orange bill and the eyes are yyellow/orange. Females: Look like males, but have yellow patches on the sides of the rump. Immature / Juveniles: The breast band is yellow and faint. The yellow collar on the mantle has a dusky wash. The red hindcrown to occiput is washed with dusky black. There are black markings on the feathers of the head and underparts. The bill is brown/black and the eyes are pale grey. Calls are generally more squeaky than that of other lorikeets. Calls made in flight are loud and high-pitched. They emit high-pitched screek notes while feeding.